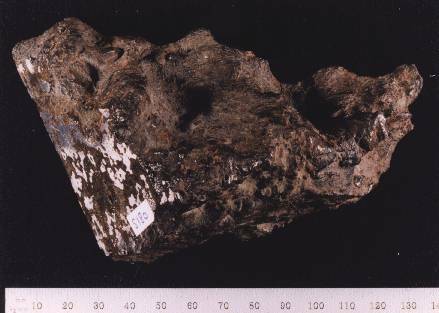 The meteorite fell three miles north of Estherville on the Lee Farm, May 10, 1879. This is the largest meteorite that has been know to have fallen in North America. It burst as it neared the earth and was seen to separate into three large pieces weighing 431, 151 & 106 pounds. It is composed of iron, nickel, phosphorous and sulfur, also some metal not know hence it has been named the Esthervillite. The center slice of the meteorite displayed at the Estherville Public Library weighs eight and one-half pounds and was cut from the 151 pound piece now in the University of Minnesota Museum, and loaned by them to the Estherville Chamber of Commerce for display in the Estherville Public Library. Late on a Saturday afternoon, May 10, 1879, many persons in and around Estherville were startled by a terrific explosion in the sky. The earth trembled, china shifted on cupboard shelves, doors and windows jarred, and window panes were broken. The explosion was followed by thunderous sounds and the appearance of what seemed a ball of fire, traveling from southwest to the northeast. Three persons north of town, more than half a mile apart, saw dirt fly high into the air. A METEOR HAD FALLEN! Report of its light came from a wide radius, a civil engineer surveying a railroad near Jackson, Minnesota, 15 miles northwest saw the heavenly body emerge, "brilliantly white" from a storm cloud in the west. Estimating its height at 40 miles and its speed at three miles per second, he said it seemed to draw portions of the cloud after it. Two people crossing the prairie in an open rig near Superior, Iowa, 6 miles west of Estherville, found themselves directly under the mass when it exploded. They reported the three large pieces took separate directions, trailing ribbons of vapor which formed a crow's foot in the sky. A herdboy near Superior, reported that falling stones had caused his cattle to stampede, and other boys at Four Mile Lake said the placid water had been peppered with small pebbles. The largest piece of the meteor fell in a six-foot hole on the Sever Lee farm two miles north of Estherville. On May 11, eight young men of the neighborhood vainly attempted to raise it from the mud and water, where it lay buried 14 feet below the surface. Lee's seeming indifference to the meteorite induced the boys to hire a well digger, George Osborn, to raise it. Weighing 437 pounds and measuring 27 x 22-3/4 x 15 inches, its "fearfully rough" black surface was broken with a metallic glitter. The lively interest manifest at Estherville led the farm boys to realize the commercial value of the meteorite. Loading it into a wagon, they set out across Minnesota, displaying a large sign that read: "I am the Heavenly Meteor. I arrived May 10th at 5 o'clock. My weight is 437 pounds. From whence I came nobody knows, but I am enroute for Chicago!" Hearing that their ownership was being questioned, the boys returned to Estherville, wrapped their treasure in quilts and buried it in Osborn's cornfield. Later, feeling secure in their ownership, they moved it to the home of one of the group, Chester Rewey. Charles N. Birge, an attorney from Keokuk, through Lee's temporary default in payment on his farm purchased from a railroad company, made claim to the land. On the strength of this, he obtained a writ of attachment on the meteorite which permitted him to take it away from Rewey's farm. Later he sold it to the British Museum for a reputedly large sum. In the following October, the Lee's were deeded their farm by Birge. The second meteorite was found on the A. A. Pingrey farm, four days following its decent. Weighing 151 pounds, it was buried four and one-half feet on a dry knoll two miles west of the first find. Pingrey, unaware of its value, gave the stone to a neighbor, John Horner, an act he later regretted. Horner hid his treasure in cave on the land of Abe Ridley, where by the glimmer of a lantern, the transaction took place by which the University of Minnesota became owner of the other piece. The third large portion, 92-1/2 pounds, was found by the Pietz brothers while trapping in February 1890. It had dropped into a dry slough four miles southwest of the first find, and had penetrated five feet. Birge ultimately purchased this piece. That spring, following the prairie fire, "gathering meteors" became a diversion of picnic parties and Sunday expeditions participated in by hundreds of people. Some 5,000 of the sparkling bits were found, ranging from trifles the size of a pea to lumps weighing a pound. Many finger rings were made from the larger pieces; today some are unpurchaseable keepsakes of local citizens. Three great meteoric showers have occurred within the State of Iowa. One fall was at Homestead, in Iowa County, in February, 1875, the meteor weighed 460 pounds. In 1890, another shower occurred at Forest City, Winnebago County, with masses weighing between 200 and 300 pounds fell. With a total weight of 744 pounds, the Estherville meteor is the largest and from a scientific standpoint, the most important. A specimen of the Estherville Meteor is on display in the Estherville Public Library through the courtesy of the University of Minnesota. The University retained the rest of the specimen. The Musee National d'Histoire Naturelle of Paris and the Naturhistoirsches Museum of Vienna, each contain portions of the meteorite originally sold to the British Museum of Natural History, London. Pieces are found in the Field Museum in Chicago, the U.S. National Museum in Washing ton, the American Museum of Natural History in New York City and in the Peabody Museums at Yale, Harvard and Amherst.